Google Home users in the U.S. and Canada can now make free voice calls using Google’s brilliant little smart speaker. You can call anyone in your contacts list, as well as millions of businesses in North America, all without using your hands. And the best thing is it’s all done over Wi-Fi. The Amazon Echo was a game-changer, as it made people actively want to install a listening device in their homes. Google Home is Google’s answer to the Echo, and very good it is too. However, Amazon added voice calling to the Echo You Can Now Make Free Voice Calls Using Alexa You Can Now Make Free Voice Calls Using Alexa Anyone with access to Alexa can now make free voice calls. This not only goes for people with Echo speakers, but also people who have the Alexa app installed on Android or iOS. Read More in May, which left Google playing catchup. Google is now adding voice calling to Home’s already impressive skillset. Home owners in the U.S. and Canada can call anyone in their contacts list for free as long as they are also in the U.S. or Canada. And it’s as simple as issuing the “OK, Google” command followed by the name of the person you want to call. It doesn’t matter if the person you’re calling is at home, in the office, or on their mobile, as long as you have the number stored in Google Contacts. 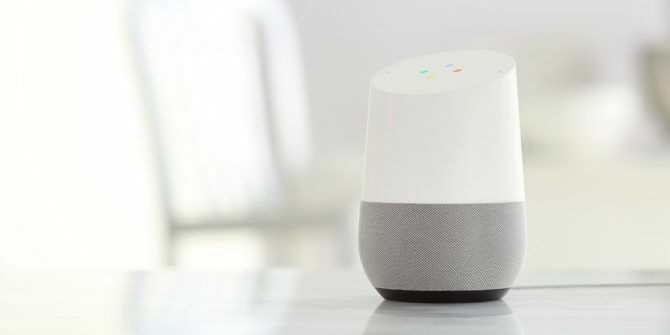 Google Home can even recognize individual users’ voices, which means you can say something like, “OK, Google, call Dad,” and Google will know which dad to which you’re referring. Google Home can also call any one of millions of businesses located within the U.S. or Canada. You can refer to the company by name or location, or you can just ask Google to call the nearest bakery or coffee shop. All calls are placed over your Wi-Fi connection, keeping your phone completely out of the equation. The only failing in any of this is that the recipient of your call won’t be able to see your phone number. Instead, they’ll see “Unknown” or “No Caller ID”. Which means many calls are likely to remain unanswered. This doesn’t apply to Google Voice or Project Fi users though, both of whom can choose to have their number displayed. By allowing users to make voice calls through Home, Google hopes to make everyone more reliant on its technology. The end goal being to make Google Home an essential piece of tech we all need to own. That is if Google manages to see off both the Amazon Echo and the Apple HomePod Amazon Echo vs. Google Home vs. Apple HomePod Amazon Echo vs. Google Home vs. Apple HomePod In this article, you'll learn the differences between the Amazon Echo and Google Home. We'll also take a look at what features an Apple speaker may include. Read More . Do you own Google Home? If so, what do you use it for? Can you see yourself making voice calls? If so, under what circumstances? Do you think smart speakers are the future? Or are they just a stop along the road to the future? Please let us know in the comments below! Explore more about: Google, Google Home, Google Voice. , still can't use voice calls. Says something went wrong try again in a few minutes.